To grow, remain relevant, improve a dire situation, or for any number of other competitive reasons, organizational leaders often decide the best course of action is to transform their organization. Some transformations are sweeping, impacting most facets of the enterprise, while some are narrowly focused, affecting only a small portion of the organization. Transformations carry risk to the organization, and L&D can take actions to reduce that risk. When applied to organizations, the definition of transformation varies, leaving room for differences to emerge. One way to define a transformation is by a category or type. For example, digital transformation can be defined as the “use of new digital technologies (social media, mobile, analytics or embedded devices) to enable major business improvements (such as enhancing customer experience, streamlining operations or creating new business models).” Other types of transformations include changes driven by total quality management, re-engineering, lean operations, customer experience, bimodal IT, and others, with the ultimate aim of improving the business. Transformations will continue to create a complex, fast-evolving and turbulent world for L&D teams. According to Scott D. Anthony, the word transformation can confuse three different categories of effort. One level being operational (or doing what you are doing better, faster, or cheaper) which may be less invasive, carrying a lower organizational impact, than changes to the operational model (doing what you are doing in a fundamentally different way), which is less risky than strategic, which may change the very essence of the enterprise. In our experience, transformation can be, and often is, a mixed bag of ideas, goals, methods, and tactics. A common theme we see is that transformations are meant to change or improve the organization in some valuable way. Organizations have served their competitive instincts and made strategic decisions to pivot and transform for as long as there have been businesses. New drivers that push organizations to transform may emerge (e.g., digital transformation is the rage today, much like total quality management was in the past), but evidence and observations suggest the primary competitive, financial, and market motivations to transform remain roughly constant. KPMG’s 2016 Global Transformation Study says 96 percent of organizations studied were in some phase of transformation, and nearly half had completed at least one transformation in the preceding 24 months. According to the research by Hausberg, digital transformations are occurring in finance, marketing, manufacturing, supply chain, and other arenas. In short, these major changes can be found worldwide and within all industries. Transformations will continue to create a complex, fast-evolving and turbulent world for L&D teams – and there are no signs of that stopping. Here are several ideas to help L&D find the upside. Even in a steady-state organization, aligning to business goals can be a challenge. Transformation can up the ante. However, this is an opportunity to evaluate and refresh relationships and understand the organization in a new light. Transformation can also change the mix of stakeholders, whose ideas and influence challenge the status quo, refocuses the organization on new goals, accelerates the velocity of change, introduces new processes, reconfigures functions, redefines how work is done, and may make a host of other changes – and along the way, compel L&D to reset its understanding of priorities, trade-offs, decision making and the political landscape. In response, L&D may need to assert itself in different or new ways. As a transformation unfolds, L&D needs to engage leadership, re-evaluate relationships with existing stakeholders to determine their relevance or influence, and sort out whether their goals have changed. Concentrate attention on those who remain relevant – deepen your understanding of their goals and motivations. See the transformation through their eyes. Take time to identify and meet each new stakeholder, discuss their goals and how they view the transformation, understand their influence and role in decision making, and then develop an approach to work with each stakeholder. Not all stakeholders will have the same point of view (or goals), so track the relationships, develop an influence map with a game plan for working with each stakeholder – adapt tools your sales team uses to map and manage client-side stakeholders, buyers and decision makers. It’s not exactly the same thing, but it’s close enough. Transformation creates a state of motion, and based on research findings and experience, organizations are likely to remain in a state of motion. Recognize that alignment – and stakeholder engagement – is likely to improve when L&D’s approach is adaptable and ongoing rather than rigid and infrequent. Because transformations aren’t uniform in purpose, size or complexity, they often unevenly impact parts of the organization. Talk about the scale, scope, and complexity with the stakeholders. They often have a good sense of where the impacts will be felt. From there, L&D has an opportunity to help the organization zero in on the highest impact areas and roles. Introducing a performance consulting capability to the transformation can help the organization predict and define where the change to work, knowledge and skill requirements and simultaneously the benefit to the transformation will be greatest. This sort of role-targeted, performance-focused approach is often what stakeholders want to see – in part because they recognize the direct connection between the approach, the outcome, and the value to their cause. L&D can help the organization predict and define where the change to work, knowledge and skill requirements will be greatest. Backed by a solid understanding of the stakeholder goals, and knowledge of the roles or areas that need the most attention, L&D has the opportunity to demonstrate its ability to understand and respond to gaps between current and future role requirements. Again, engage a performance consulting capability to describe the gap in business terms. Developing a business-friendly definition encourages stakeholders and subject matter experts to engage more freely, in their own language, using their expressions. Working with top performers and subject matter experts who can envision the future state and compare it to the current state will aid in defining the gap. L&D can help the business see that because transformations often introduce new performance, knowledge and skill requirements. Employees may find the value of their existing patterns of practice, short-cuts, etc. diminished, with an outsized effect on top performers, pushing them backward toward conscious incompetence. Even under the best of circumstances, transformations often temporarily lower overall employee productivity. By focusing on employee performance, L&D can help minimize the duration and severity of the dip in productivity. Keep it simple. When a job-aid is sufficient, use a job aid. Address the system of performance, management support and coaching, feedback, alignment of expectations and consequences, etc. Let the performance requirements guide training decisions about modality, how content is organized and sequenced, duration of modules, etc. Lean heavily on research-based instructional methods that have a track record of proven outcomes. Give only sparing consideration to unproven, experimental approaches. When a non-training issue arises, partner with other functions to put the issue in the proper organizational location. An important part of the conversation with each stakeholder and the group of stakeholders involves data and how success will be measured. 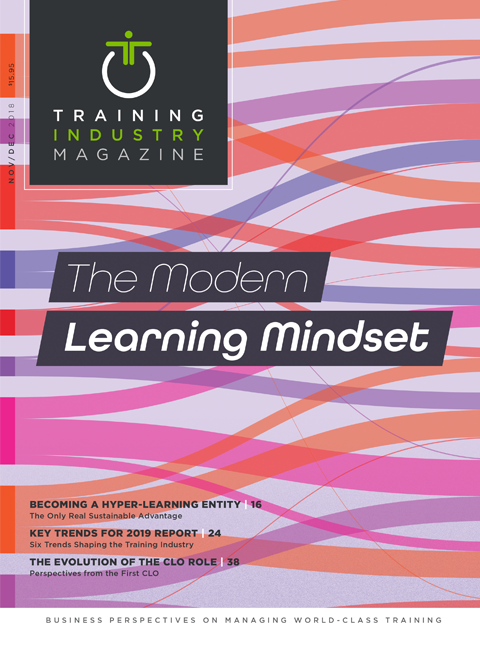 It’ll take some effort but work with the stakeholders to unpack the transformation-level measures to reveal those at the L&D level – said another way, where the impact of L&D’s efforts will be measurable. To lock it all together, create a bright-line connection between the future state work, knowledge and skill requirements and the business measures. This represents an opportunity for L&D to shift its thinking and approach and offer the business a different or new perspective. L&D can help the organization align and integrate the data L&D can provide with the metrics business stakeholders care about. This kind of integration can be a challenge, and the challenge can be compounded when a transformation simultaneously introduces new data and measurement requirements, pushing both the business and L&D outside existing data and environments. In addition to using sound methods to measure knowledge acquisition and application, L&D can work with the business to find different or new ways to measure impact or ROI; an outcome that will resonate well with business stakeholders. It goes without saying that budget constraints will often limit data collection and analysis efforts. By developing an internal capability for data analytics or partnering with internal IT resources, L&D puts itself in a position to step forward and guide the process with the stakeholders. Emerging and new technologies enable more sophisticated data collection and data analyses. However, just because some things can be measured, doesn’t mean that they ought to be, or that the measurements themselves are valuable. Work with the stakeholders to make the best use of existing data, or when that isn’t a viable option, work with them to determine what data will meet their needs and help them answer relevant questions. Business transformation has been a useful tool for leaders, and it is likely that transformations will continue and perhaps even accelerate. By creating methods for ongoing alignment, developing deep understanding of changes in work, knowledge and skill requirements, choosing highly effective training solutions and developing data to answer measurement questions, L&D will be indispensable to the transformation process.